The process of hair thinning or hair loss can be traumatic, especially to young and energetic individuals. 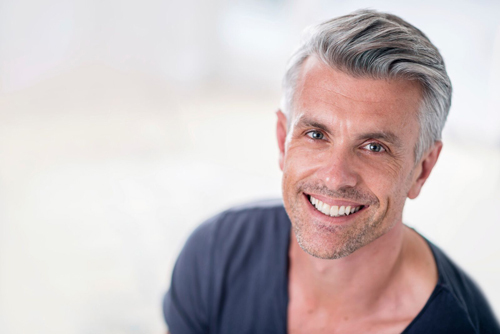 Surgery is a costly and dangerous option that may never give you the true results that you’ve been hoping for, which is why we offer non-surgical hair replacement systems that are 100% natural and matched to your original hair colour. At 3rd Dimension Studios, we’re committed to putting you at ease and giving you your confidence back through a beautiful head of hair — and no one needs to know that it’s a hair replacement system. Transforming from full or male pattern baldness to a luxurious and healthy head of hair is as simple as visiting our hair technicians for a consultation, measurement, and mold of your head. We’ll walk you through the process and ensure that you not only get what you want, but leave our salon looking 10 years younger. Located conveniently in central Toronto, 3rd Dimension Studios is an intimate men’s and women’s boutique hair replacement salon where we treat you like family. We know what it’s like to feel shy or self-conscious about your thinning hair, but our technicians are committed to learn your needs, concerns, and lifestyle so that we can provide the best possible solution. Your custom 3D high definition system will be sure to fit in with your lifestyle — for not only the most natural look and feel, but to also last as long as possible. Why order something off the internet when you can have the personal touch and commitment of a hair technician who knows exactly what you need and want. Our goal is to improve the lives and confidence levels of all of our clients, one hair system at a time. Our systems are custom made so that they provide you with the levels of fullness and shape that you’ve been looking for, matched directly to your current hair colour — or any colour you’re looking to try on! With a fully undetectable hair system, you’ll be able to walk a little taller and smile a little brighter. Do you want your youthful hair back? All balding men do! Do you want to get a Free Hair System? 3rd Dimension Studios HD Hair Systems was founded with the promise to its clients that we will show them the road to the highest quality non surgical hair replacement systems available in Toronto and the rest of Canada, US and UK. Our commitment to our clients and absolute care we take is founded on the idea of respecting your time, feelings, emotions and your desire to totally confidential hair replacement systems. We care about your emotions in changing the aging process we all go through and renewing your image and confidence back to a place in time it was before.